This fantastically patterned shirt is quite a find. I unearthed this from my own collection; I have never worn it. It is a used true vintage piece that has a hint of wear, but is in very good condition. The shades of blue are bit more muted in person with more of a gradual blend. The darkest color is navy, not black. Taupe lines divide the other colors of white, baby blue, pale slate blue, slate blue, dark cornflower blue and dark navy blue. The large collared shirt would fit a current medium. It does not run small. It is a full medium as it measures 42" around at the widest point under the armpits. It would best fit a 38" chest. The length of the front from the shoulder to the bottom is ca 28". The sleeve length front the base of the neck across the shoulder, down to the wrist is 32". 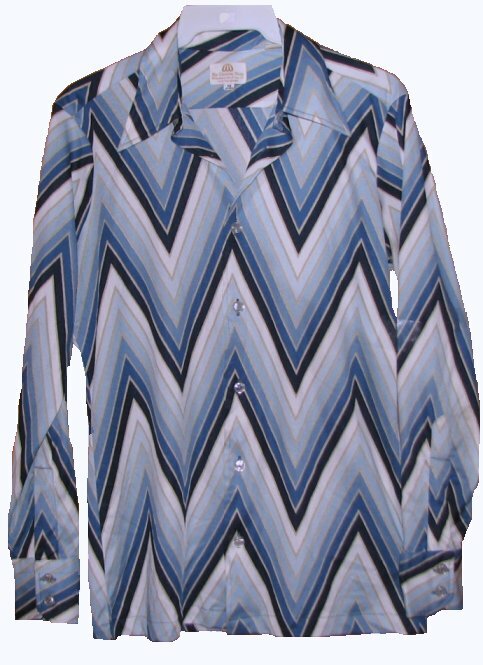 The gently worn vintage gem is a slinky thin 100% polyester knit. There are no outstanding imperfections.